Ilana Crispi & Terrance Graven will feature their collaborative video piece entitled, Green Room. Equilux is a day in which the durations of light and darkness are equal. It occurs a few days before the spring equinox and a few days after the autumn equinox. This date will vary depending on where on Earth you are, and indeed equiluxes do not occur at all close to the equator, whereas the equinox is a fixed instant in time when the sun crosses the earth's "celestial equator". 1400 Pomona St., Crockett, Ca. Artists have long embraced the themes of memory, recollection, the passing of time. Their art may be a memorial to a person or event, a way to cope with trauma, a way to remember a place or experience or a way to challenge perceptions of what may have taken place versus what exists of the experience now. "What Is, Was." brings together eleven Bay Area artists who examine these themes, creating artworks that explore concepts of the past, of memory and recollection. In this day of digital, fast-food media and a transient sense of time, the exhibition presents a realm of unhurried, subtle art processes, where artists might bring their pasts forward for us to view in the present and others may question notions of past and present. The exhibit includes performance art, installation, sculpture, book art, photography, paintings and drawings to show the range of media used to explore the theme. The artists are: Dustin Burt, Terrance Graven, Kathy Kearns, Linda Klein, Midori, Oona Nelson, Sara Press & Andrew Rottner, Anna Noelle Rockwell, Martin Webb, and Gina Zetts. Midori will present a performance and installation from her Evoko series, first presented at the Asian Art Museum of San Francisco. Anna Noelle Rockwell, the curator of the exhibit, will bring two of her series, Subjection and the Horror of the Family, together in paintings and drawings. Kathy Kearns explores the theme of ancestry in the context of historically influenced pottery. Terrance Graven continues his Good Mourning series originally exhibited at SFMOMA. This group show will feature original works of art in postcard-size. Four of my new 2D mixed media pieces entitled–The Sun Was Extinguish'd I-IV, will be featured in three shows. They use paper, human hair, gold leaf, and paint. After the main exhibition, the artworks will be sent as a small gift to residents in nursing homes, orphanages, and homeless shelters worldwide to make them feel a little bit less lonely during the Holiday Season. I am very excited to have been chosen for this prestigious art show. I will create an installation unlike most of my other work. It will reference my professional experiences as an art preparator and exhibition designer. The second half of the show will feature the remnants of the installation reinvented by an anonymous art preparator. Through the work of artists who capture the spirit of "now," YBCA's signature triennial, Bay Area Now, brings to life current perspectives for both this art center and the regional art scene. In its seventh edition, BAN7 is experimenting with a new approach to curating that highlights collaborations with our region's artists and arts organizations and pushes beyond presentation toward a multidisciplinary celebration of the diversity of artistic practices in the Bay Area. BAN7's core idea is to decentralize the curatorial process, and centralize the public presentation of some of the most exciting artistic voices in the region today. Now in its fourth iteration, 100 Performances for The Hole is a mini-marathon of time-based performance. Each performance lasts just two minutes and takes place in, around, in contradiction of, or is inspired by “The Hole,” a 100-year-old former sand casting pit in the floor of the SOMArts Main Gallery. The history of the hole is one of radical self-expression and experimentation. The only rules are performances must adhere to a precise time signature of two minutes, and performers may not harm themselves or others. Past performances have included the unorthodox usage of bodily orifices, a set from a heavy metal band, and ritualistic offerings. Who knows what may transpire this year when 100 brave and experimental performers take to the hole? Third Strike: 100 Performances for The Hole is a mini-marathon of time-based performance. Each performance lasts just two minutes and takes place in, around, in contradiction of, or is inspired by “The Hole,” a 100-year-old former sand casting pit in the floor of the SOMArts Main Gallery. OFF Space is pleased to present an afternoon of performance works by artists Terrance Graven, Justin Hoover, Bert Bergen and Jack Leamy, Emmanuelle Namont Kouznetsov, Krisztina Lazar, Michelle Morby in conjunction with a reception for all Ever After artists on Sunday November 20th, from 2 - 5:30pm. Maggie Simpson Adams, Glenna Cole Allee, Rachel Dawson, Victoria Heilweil, Elyse Hochstadt, Karrie Hovey, Phil King, Marya Krogstad, Yuki Maruyama, Emmanuelle Namont Kouznetsov, Jessica Pezalla, Luther Thie, Linda Trunzo, Andrew Witrak, Kathrine Worel. The Chapel of the Chimes, aside from its historical importance and architectural beauty serves as a site of repose, contemplation, transcendence and remembrance. It is, on many levels, easy to draw comparisons of intent and use between the Chapel and museums, as art too is a portal to the sublime—the intuition that there is something powerfully beautiful and perhaps fearsome beyond our quotidian experience. The intention of this exhibition is to draw parallels between the “eternal” qualities of art, qualities that give ones life meaning and The Eternal, that which awaits us all, and which is honored at the Chapel. As each “mini installation” will be relevant to the chapel in which it is placed, it is our hope that the artwork will provide a thought provoking moment of surprise and beauty for visitors and an opportunity to reflect upon creation in its many guises. Chain Letter is a group exhibition based on admiration. Initially conceived by Christian Cummings and Doug Harvey in 2006, inclusion in the exhibition is based on invitation by someone who admires your work. Each artist invited then invites ten other artists whom they admire, and so on. This email invite will circulate for thirty days, at the end of which each artist will install their own work on the floor at Shoshana Wayne Gallery. This exhibition is rooted in the ideals of inclusion, and highlights the social nature of the art world. It is the hope of the curators that the response will be vast and that the artists represented will be an exponential representation of all artists that are currently working and admired by their peers. Chain Letter mimics communication today; and the way in which information is passed. The outcome will be a testament to the power of connectivity within society at present. The Lab Performance and Sound Art Festival: Division of Labor playfully examines experimental music, sound, performance, and DJ Culture, bringing together distinctive artists and uniting diverse audiences from within The Lab’s innovative creative community and beyond. Terrance Graven and Heather Ciriza will present a collaborative piece entitled, Nothing to Stand On. It will incorporate sculptural elements, live performance, and a live sound piece that will explore falling into the wound and the escape of disconcerting dreams. 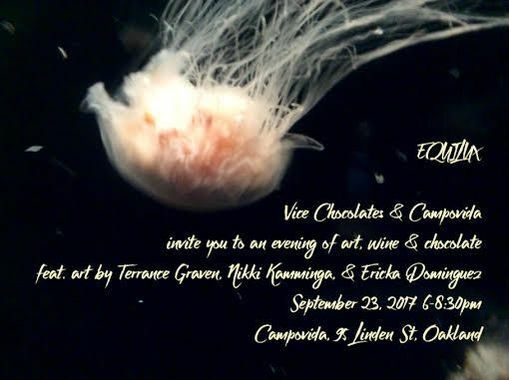 Terrance Graven will present a solo performance piece entitled, The Body Speaks to the Worms: By You My Flesh Is Horribly Decorated. It will feature sculptural elements, live performance, and a sound piece that skirts issues of entrapment and the body in distress within the context of the 14th century and its relevance to modern day living. Stephanie Syjuco: An in-gallery emporium of local artists' merchandise that explores alternative models of distribution. The exhibition itself will continually change, with a varying array of works on view; from this gathering of diverse forms and voices, common themes emerge: fragmentation, fragility, entropy, metamorphosis, reconfiguration. Terrance Graven will exhibit mourning ribbons, gold leafed medications, and embroidered patches. This presentation contemplates how experiences and representations of the body are embedded in socially conditioned modes of expression, and are constituted as sites/sights of identification, agency, and personal history, articulated in varied cultural spaces. Friday, August 13, 7:00 - 10:00 p.m.
Friday, August 20, 8:00 - Midnight. Gallery hours: Wednesday - Saturday, 1:00 - 6:00 p.m. Featuring: Vincent Como with Reuben Lorch Miller, Eric Larson, Rachel Dawson, Josh Hagler, Faye Kendal, Eric Madsen, Malcolm Smith, lourdes of the flies, Michael Campbell, Caitlin Denny and Marcella Faustini, Terrance Graven, Ben Venom, Ryan De La Hoz, Kara Joslyn, Group Rhoda, Amir Coyle, Gerritt Wittmer and Paul Knowles, and No Peace at the Gates. Inspired by The Black Laboratory of Brooklyn artist Vincent Como, Black Lab investigates the cultural connotations and psychological implications of the darkest color. Michael Campbell, Eric Larson, Reuben Lorch Miller, Malcolm Smith, and Ben Venom deploy counterculture themes and imagery in two and three dimensions. Artists Rachel Dawson, Erik Madsen, and Como formally evoke aftermath, decay, and possible transcendence through color and texture in paintings, drawings, and sculpture. Faye Kendall's, Kara Joslyn's, and Ryan De Hoz's sculptures and drawings tap into occult and animalistic archetypes. Marcella Faustini and Caitlin Denny's multi-media installation plays with popular fascination with dark topics in science. Painter Josh Hagler's portraits, artifacts from the life and family of Anton LaVey, Lourdes of the Flies, and No Peace at the Gates portray the flip-side of American religiosity. Performances by Terrance Graven, Group Rhoda, Amir Coyle, and Gerritt Wittmer and Paul Knowles enact paranormal ritual and unspeakable mysteries. Gallery Hours: Monday -Thursday 10-1 or by appointment. A group exhibition of bay area and midwestern artists presenting meditations on the ultramundane products that surround us. Using 'Junk Mail' as a roadmap participants create homages to the detritus of the mail slot. 285 9th St @ Folsom St.
Terrance Graven will feature two photographs and a performative installation entitled The Spoiler Set / His Seal of Silence which will be performed on May 22nd. A few highlights of the evening will include: Elyse Hochstadt's sculptural installation "half truths and uncertain realities" which deals with the construction of memory with it's aspects of myth and fantasy; Philip Greenlief's solo saxophone performance of the original composition, "Mirrors," with which he will "seek to destroy the security blanket of western harmony; " Vita and Bryan Hewitt's scanned x-ray photographs, which allude to the collective memory of place, specifically, of San Francisco, in all it's true and fictive transience; Pantea Karimi’s prints, which combine iconic imagery from her homeland of Iran and the U.S. in a metaphoric layering that alludes to cultural identity, societal restriction, corporate hegemony, and political censorship; Terrance Graven's performative installations which use ritual materials to explore mortality, loss, and the frailty of the body; and John Melvin’s site-specific installation exploring the idea of transitional states. On March 6th, for one night only, SOMArts Cultural Center will feature a progression of two-minute performances by one hundred artists. SOMArts has a unique space, among other attributes, it houses a large mechanics pit in the floor of its main gallery. This pit will be transformed into a unique platform for performance. After the live event, documentation of all the pieces will be exhibited in the gallery for the duration of the month. Opening on Oct. 9th from 6:00 - 10:00 pm.